Mandalay is the second Capital of Myanmar and it used to be the last capital of Myanmar kingdoms before the British Empire took control. 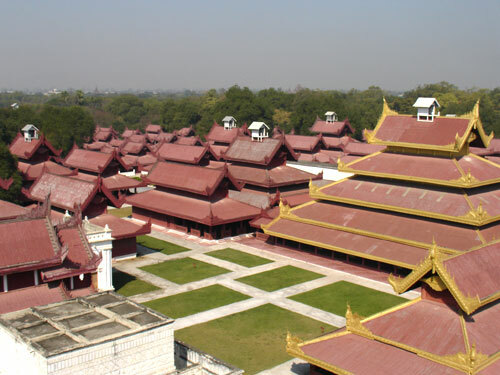 Myanmar arts and crafts, the old Mandalay palace and moat, many of Buddhist monuments and the daily life style of upper Myanmar can be seen. Gold leaf beating, tapestry, turnery, marble stone carving, silk weaving and gold smiths are worth visiting. Mandalay as a town is not as attractive as others in the country. 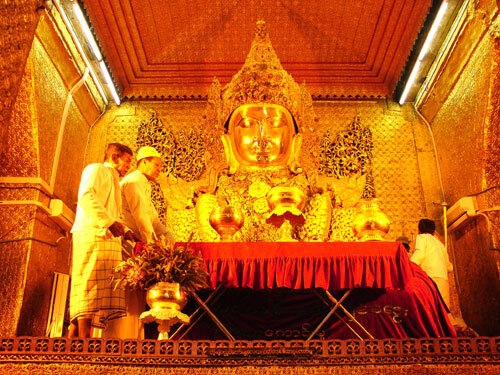 The Buddha image was brought from Rakhine state at the end of 18th Century and weighs about 7 tons. Buddhists believe this image to be an alive Buddha. There are during all the day activities at this image by monks. Many rural people from upper Myanmar gather at the four stairways. The statue of two human, lions and three headed elephants brought from Angkor can also be seen. It is the solely heritage from the original Mandalay Palace. The monastery used to be the house of Myanmar King Mindon. The whole monastery is built from teak and artistic woodcarvings can be seen in this Monastery, depicting Buddha’s life. 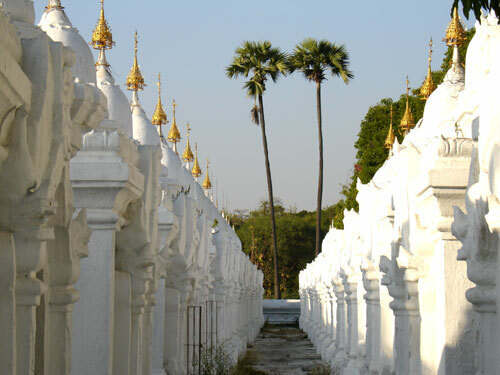 The pagoda is also known as the world’s biggest “book”, carved on 729 marble stone slabs in Pali language. This “book” quotes the three scriptures of Lord Buddha. The trees within the precinct of the Pagoda provide a cool and calm atmosphere. It was built in middle of the 19th century and bombed during the 2nd World war. Afterwards it was rebuilt. A nice spot in town with the surrounding moat, but the Palace today does not belong to the great sights. The Museum in the western part of the Palace is worth visiting if you are interested in seeing regalia of former Myanmar Kings. One of the best places to see the sunset over the Mandalay plains with the Ayeyarwaddy River as background is from Mandalay Hill. The hill rises 200 meters near the palace. A pagoda is on top and several monasteries and pagodas are located at the foot of the hill. Mandalay is known as the hub of manufacturing many Myanmar arts and crafts in small workshops. Best quality handmade paper is produced to withstand the gold leaf beating. 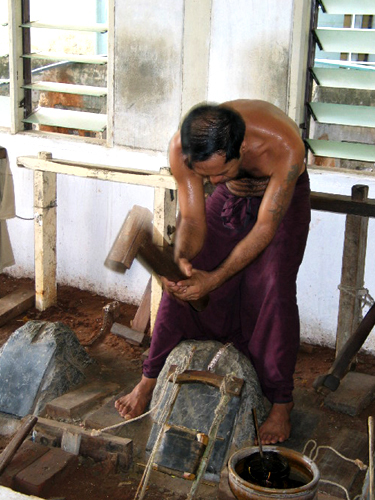 Bronze foundries, silverwares, woodcarving and sculpturing, stone carving and tapestry workshops can be seen in Mandalay.